Cast from a high performance, lightweight fibre-concrete that is tinted to the finish colour for increased outdoor durability. 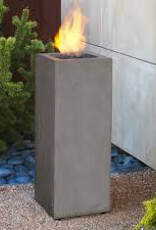 This fire column comes complete with lava rock filler, and a matching lid for when the burner is not in use. Also features a cleverly hidden, removable door to access the internally stored fuel tank. The Baltic Collection carries a CSA Certification and features an electronic ignition. 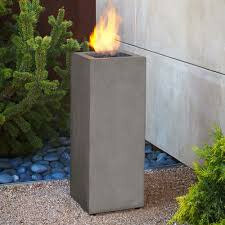 Collection available in Glacier Gray or Kodiak Brown finishes. Concrete material colour will be accurate but the actual finish may vary from photo.